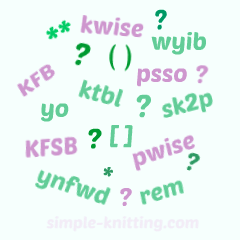 Feel a little lost with those knitting abbreviations in your knitting pattern? Knitting does seem to have it's own language especially when you're reading through a pattern. You'll see letters muddled together and terms that you may not be sure about. I've created a list of the most common abbreviations and their meanings. These are basic knitting abbreviations and as you continue learning to knit these will become much easier to understand. There's always going to be new ones popping up so get used to the basic ones, the rest will come later. And if an abbreviation is two words long it will be a short form of the two words, RH for right hand and you guessed it LH for left hand. Most beginner knitting patterns will have simple abbreviations which you'll be able to familiarize yourself with as you work through the pattern. And most well written knitting patterns will list the knitting abbreviations used plus an explanation if it's a more complicated stitch. As you practice and become more familiar with knitting the abbreviations will start making more sense too. Take a look at the list below. Some have links that you can click on for a little extra help. Please check out my page of knitting terms to help understand as well. If what you're looking for isn't here it may be on that page. Or if you can't find what you're looking for just drop me a line in the comments below and I'll be happy to help.